The Taj Lake Palace is one of the most romantic hotels in the entire world and no wonder the unsurpassed beauty of this floating palace is one of a kind! But do you know that before it was a luxury hotel, it was the summer palace for the then Maharana of the Udaipur kingdom? 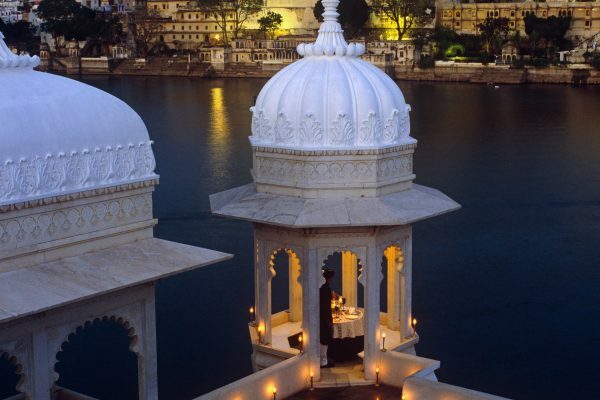 This summer palace, now known as Lake Palace is indeed the most sought after destination in the whole world. Let us read about the legendary palace built on the lake! Formerly known as Jag Niwas, the Lake Palace is built on a natural island of around 4 acres. It was built between the years 1743-1746 by the Maharana Jagat Singh II who ruled Mewar from 1734 to 1751 as the 62nd successor to the royal dynasty of Mewar. The Maharana decided to build a palace and named it Jag Niwas after himself. It’s an east facing palace and was built to enjoy summers. It is said that the Maharana had friendly relations with the Mughal emperors and hence Jag Niwas was inspired by the Mughal art and architecture. As one can avidly see, the palace has a remarkable Mughal architecture blending seamlessly with Mewar’s beauty. It was during the Indian Sepoy Mutiny in 1857 that several European families fled from Nimach and sought refuge in the Mewar kingdom. Maharana Swaroop Singh (reigned 1842–1861) helped these families by keeping them safe at the Jag Niwas (Lake Palace) and wiped out all the boats so that the agitators could not reach the families. By the end of the 19th century, time and weather had deteriorated Jag Niwas, and the Palace started losing its fame. A French writer described Jag Niwas as – “slowly moldering in damp emanations of the lake.” Even its furniture and interiors started losing its dignity. Broken old chairs, clocks, and abrupt colored glass ornaments made the palace impassive towards foreign tourists. They described the place totally deserted. In 1961, Maharana Bhagwat Singh decided to convert Jag Niwas Palace to a luxury hotel in Udaipur. An American artist became the interior designer and consultant of the project. He also mentioned in his words that – the palace was deteriorating and turning it into a hotel was only the way to restore and keep it maintained. He termed it as a job of conservation. 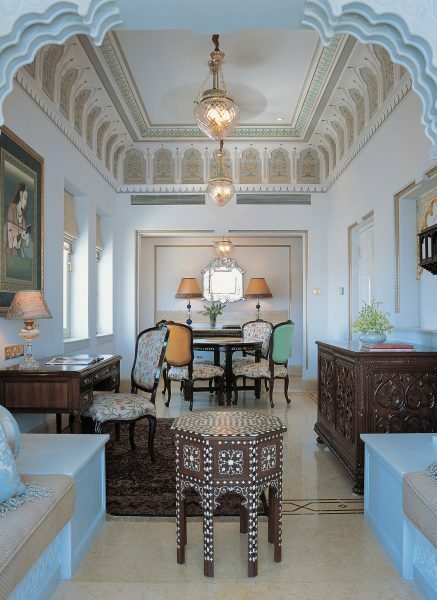 In 1971 the Taj group took over the management of Jag Niwas and the new name came out to be the Taj Lake Palace. Taj added another 75 rooms to it. Jamshyd D.F. Lam became the first General Manager of the Taj Lake Palace. Later in the year 2000, another restoration of the hotel was undertaken. The upper room of the Lake Palace is a perfect sphere of 21 feet in diameter. 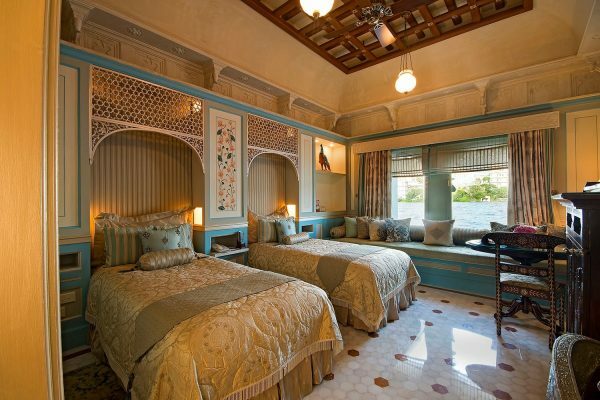 Its walls, decorated with Arabic designs similar to Taj Mahal of Agra. However, they all are made according to the Hindu religion. The floor is ornamented with the finest quality of black and white marble. The courtyards lined with columns, pillared terraces, fountains, gardens and exquisitely beautiful domes. 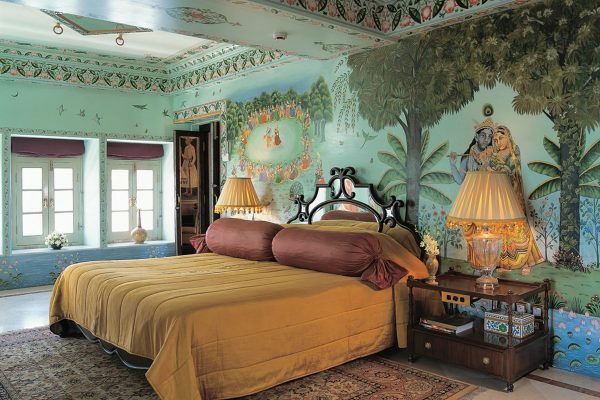 The Taj Lake Palace has a total of 66 rooms and 17 suites namely Bada Mahal, Khush Mahal, Ajjan Niwas, Phool Mahal and Dhola Mahal. 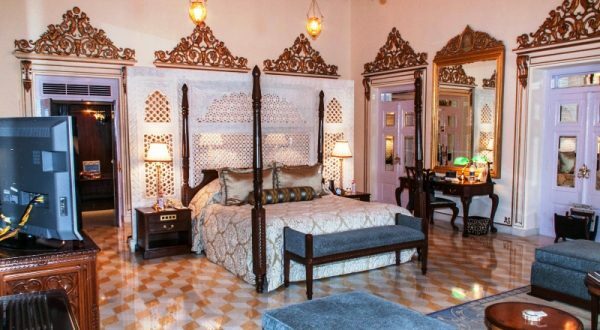 These exotic rooms are bejeweled with carved arches, paintings, crystal work, stained glass work, inland stones of pink and green lotus petals. 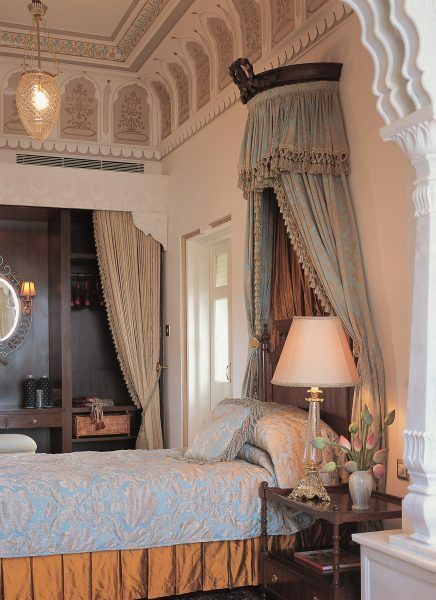 The rooms and suites give a magnificent look of the Lake Pichola. There are restaurants which serve Indian as well as European cuisines. This hotel is famous for Jiva Spa, outdoor pool, and yoga center. 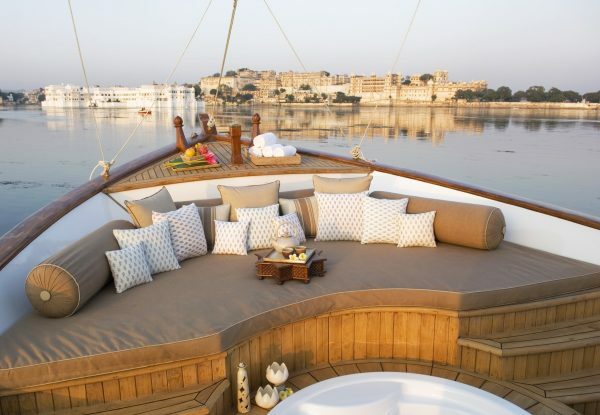 You can go for a boat ride on Lake Pichola provided by the Taj Lake Palace itself. 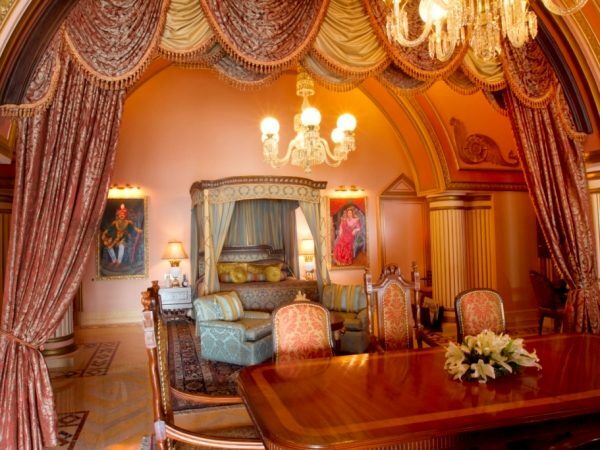 The Taj Lake Palace is undeniably one of the most luxurious properties across the country. It is invariably featured in the lists of all ‘Most Luxurious’, ‘Most Romantic’, ‘Best heritage Property’ that can give you an idea how travelers across the world praise the property. The palace’s beauty is well-known in the entire world and makes one of the most sought-after sights for travelers visiting Udaipur! 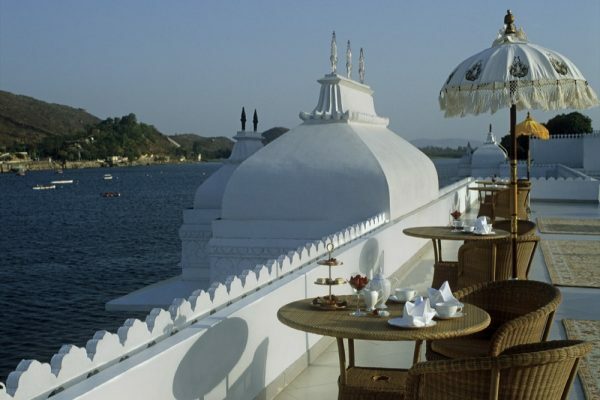 Have you ever been to the Taj Lake Palace? If yes, then share us your views on the most romantic hotel in the world, in the comments below!